Do you love Vietnamese rice paper rolls but never dared to attempt making them at home? In this how-to video I am showing you how easy it is to make delicious rice paper rolls your whole family will enjoy! Rice paper rolls are good all year round and especially in summer because they’re fresh, easy to make and really healthy. These don’t take long at all to prepare. Once you master the art of rolling, you can have them ready in no time! You can make these as a snack, an entrée and even as a main course. I like to serve them with a sweet chilli dipping sauce or with some Hoisin sauce with crushed up peanuts. Step 1 – Prepare dipping sauce by mixing all ingredients and set aside. Step 2 – Cook rice vermicelli noodles in boiling water for 5 minutes or until soft. Drain and cool. Combine with chicken, coriander/cilantro and some of the dipping sauce. Step 3 – Place 1 rice paper sheet in a medium bowl of lukewarm water for 5-10 seconds or until just soft. Place on a plate or clean cutting board. 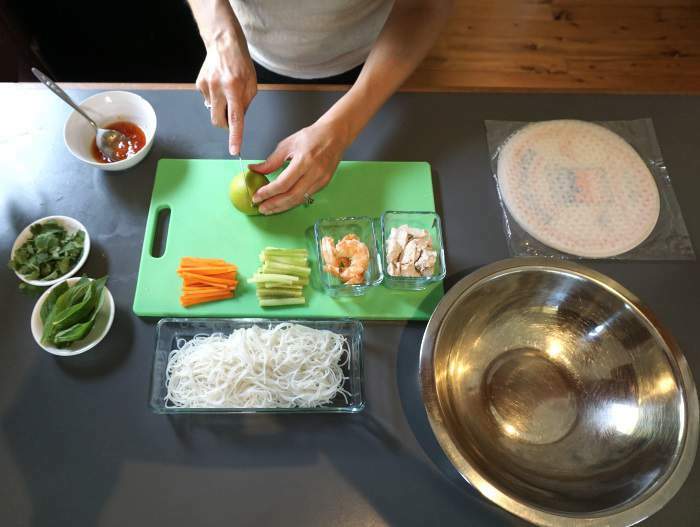 Step 4 – In the middle of the rice paper, place a mint leave, 2 pieces of prawn in a horizontal line. Below the prawns add the chicken, coriander/cilantro, carrot, cucumber and vermicelli. Step 5 – Fold ends in by bringing the bottom of the rice paper up and over the filling. Roll up gently but firmly to enclose filling tightly. Repeat with remaining rice paper sheets. Serve with dipping sauce. * Note: For best results, serve the rolls shortly after you’ve made them. If not possible, you can cover with a damp cloth and put in the fridge but don’t leave them in more than one hour as they will dry out.